Working as a graphic artist for UW-Milwaukee, I had the opportunity to indulge in projects both large and small. One of my biggest was the 2017-2018 resident handbook: an 80-page guide to living in the residence halls of UWM. 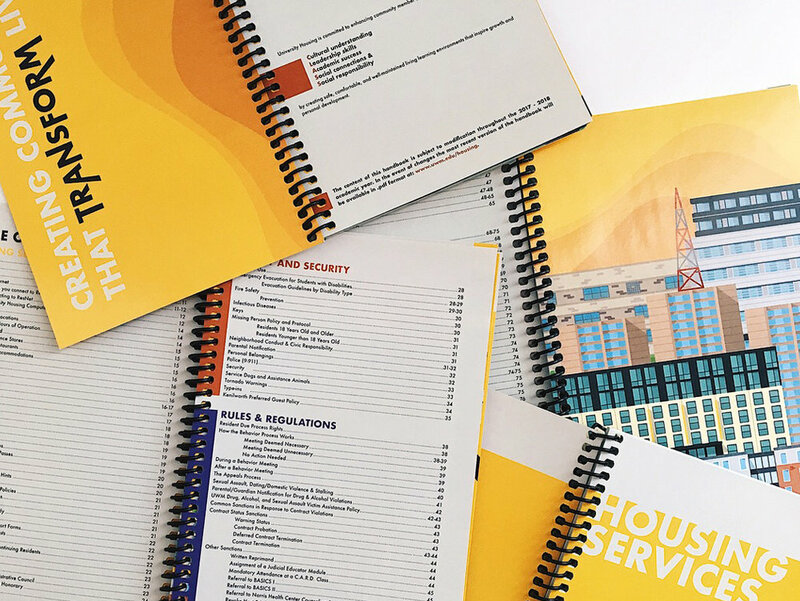 The handbook was entirely vector based, jammed pack with illustrations, icons, and the signature UWM residence hall color palette. The final handbooks were printed and delivered to over 4000 students. Being an (at the time) Adobe InDesign newbie, I faced a variety of challenges with this project. Designing 40 book spreads is no simple task, and having to consider every page fully was an absolute must. The flat illustration style was a perfect way to ground my initial worries of a project this size, as it is both a style I'm comfortable with, and a style that looks fantastic. One thing I aimed to accomplish with this project was keeping readers' attention. The bright and bold design elements were a crucial choice of mine, as I wanted students to be interested in interacting with this otherwise, relatively-boring document. The project ended up being a major home run, and the new look is one which will remain for many years to come.